Svalbard is currently undergoing a significant socio-economic transition, with coalmining—once the primary economic activity and raison d’être for all Svalbard settlements—in rapid decline. Mining proved unprofitable for much of the coal era, while blackening Norway’s claims of enlightened stewardship of the Svalbard environment and damaging its international image as a country of progressive climate policies. 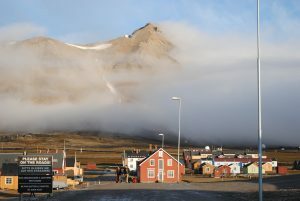 Mining operations at Sveagruva have now ceased, and Longyearbyen—the first coalmining settlement on Svalbard and locus of Norwegian authority over the archipelago—is striving to boost other sectors such as tourism, education and research, and space services to fill the large gap left by the departure of most miners and other employees of the state-owned mining company Store Norske. The Russian community of Barentsburg, meanwhile, is also transitioning towards tourism and scientific research as coal reserves there continue to ebb. Located along Kongsfjorden some 110 km northwest of Longyearbyen, outside the Isfjorden system where most mining towns have been established since the beginning of the 20thcentury, Ny-Ålesund kicked the coal habit—albeit under tragic circumstances—and embarked on a markedly different path almost 60 years ago. On November 5th, 1962 a mine shaft explosion took the lives of 21 miners, a tragedy that led to the downfall of Norway’s government and the end of the coalmining era in Ny-Ålesund. Several years after the accident and subsequent evacuation of the town’s inhabitants, the settlement was repurposed for scientific research, initially hosting a telemetry station for the European Space Research Organization and a field station for the Norwegian Polar Institute. Since the early 1990s, when an array of non-Arctic states sought to expand their scientific presence in the High North in the wake of the founding of the International Arctic Science Committee, Ny-Ålesund has transformed into an international research base for natural science. By 2000, the United Kingdom, Germany, Japan, the Netherlands, Italy and France had established research stations there, followed by South Korea, China and India in the years since. The geopolitical dimension of these facilities became apparent in the run-up to the 2013 Arctic Council ministerial meeting in Kiruna, Sweden, when additional non-Arctic states were admitted as observers to the Council. All countries represented in Ny-Ålesund placed great emphasis on their research stations when constructing narratives that positioned them as legitimate Arctic stakeholders, and thus entitled to a voice in regional governance despite their geographic location well to the south of the Arctic Circle. Science is on the ascent across the archipelago, as elaborated in the 2015-2016 Norwegian government white paper on the future of Svalbard, as well as the launch a year ago of the Svalbard Integrated Arctic Earth Observing System. Norwegian authorities have taken a renewed, more assertive stance on coordinating and to some extent steering international scientific activity, while more explicitly foregrounding Norway’s key role as host, facilitator and provider of infrastructure and logistical support for the research institutes present in Ny-Ålesund in particular. This is indicative of the overarching Norwegian geopolitical imperative on Svalbard: maintaining robust communities and exercising authority under the 1920 Svalbard Treaty, which granted Norway sovereignty and motivated much of the vast expenditure on coal mining over the past century, and today strongly influences policies in the realm of research and education on Svalbard. Local manifestations of Norway’s increasingly firm engagement are the forthcoming (expected March 2019) research strategy for Ny-Ålesund drafted by the Research Council of Norway, and the enhanced leadership role assigned to the Norwegian Polar Institute for implementing the strategy. At the same time, the government white paper calls for a shift away from “national” stations associated with research institutes of particular states, towards thematic facilities, such as the Kings Bay Marine Laboratory and the soon to be inaugurated terrestrial laboratory, that are intended to be shared by all Ny-Ålesund scientists. Although Ny-Ålesund is explicitly a place for natural science research, several social scientists have in recent years shown interest in human activity as such in the settlement, including social anthropologist Paul Wenzel Geissler and human geographer Minna-Liina Ojala. My own research explores the contemporary history of Ny-Ålesund, and the convergence of science, geopolitics and environmental protection on Svalbard and the wider Arctic. Studying these interconnections inspired me to launch the podcast Polar Geopolitics, which, in the context of global environmental change, takes up these and a range of related issues such as governance, geo-economics, indigenous communities, sustainable development and science diplomacy in the Arctic and Antarctica. Each episode features interviews with experts on particular polar topics. The podcast is available on most major podcast platforms as well as www.polargeopolitics.com. It can be followed on Twitter @polargeopol and Facebook https://www.facebook.com/polargeopolitics/. Feedback and ideas are very welcome—please feel free to contact me at paglia@kth.se. Eric Paglia is a postdoctoral researcher at the Division of History of Science, Technology and Environment at KTH Royal Institute of Technology in Stockholm, Sweden. His dissertation is entitled The Northward Course of the Anthropocene: Transformation, Temporality and Telecoupling in a Time of Environmental Crisis (2016).